In Spring 2004, the Watershed Center, in partnership with Ball Environmental & Planning Associates and the Great Lakes Environmental Center, completed a multi-faceted study of Boardman Lake as part of a Michigan Coastal Management Program grant funded through the National Oceanic and Atmospheric Administration and the Michigan Department of Environmental Quality. The study identifies and evaluates the physical, biological, and built infrastructure resources of the Boardman Lake watershed for potential impacts to the water quality of Boardman Lake and the lower reaches of the Boardman River. 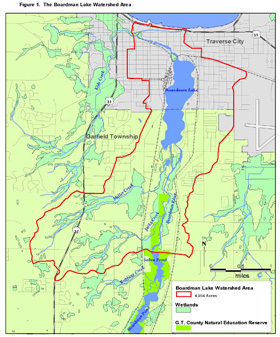 Additionally, the study complements other watershed management plans within the region, including the Watershed Center’s Grand Traverse Bay Watershed Protection Plan, and provides recommendations to reduce impacts on water quality within the region. Land use in the watershed is currently comprised at up to 52% residential, commercial, industrial, and transportation/utility. The average amount of sealed, or impervious, surfaces within the watershed is 24.7%, based on aerial photo interpretation and computer modeling. Note: Water quality degradation is observed at 12-15% imperviousness within a watershed. The Boardman Lake watershed is more than two times this threshold which is not uncommon for a highly urbanized watershed. 43 sites of environmental contamination exist within watershed of Boardman Lake, of which 29 (67%) are uncontrolled or remain “active” sites as defined by the MDEQ. Based on historic aerial photo interpretation, an estimated 36% of the original wetlands in the watershed have been filled. Sediment “hot spots” with petroleum constituent contamination were found at or near Cone Drive Textron, former Stromberg Carlson, 14th Street, WWTP and TC Iron Works. Sediment “hot spots” with heavy metals contamination were found near the end of 14th Street, the wastewater treatment plant and TC Iron Works. Nutrient contamination was found at tributaries on the west side of Boardman River 0.1 mile south of the former Keystone Road dump, YMCA (3 tributaries), and Kids Creek. Nutrient contamination was found in stormwater culverts at east and north sides of the lake, south side of Union St. Bridge, from Post Office parking lot area; at 6th Street Park, at Front St. Bridge, the parking area near fish ladder/weir, and at South Airport Road. Bacterial contamination was found in the culvert on the east side of Cass St. Bridge, two small tributaries immediately downstream of Sabin Dam, at west side of Boardman River 0.1 mile south of former Keystone Road dump, and at Kid’s Creek. Hot water (96.8 degrees F) was found flowing from a pipe at downtown Cass Street Bridge. Milfoil and water celery were the most common aquatic plants found. There were no threatened or endangered species and two new species that were not present in previous inventories were identified. Water clarity was 12-18 feet. An area lacking plant, insect, animal life was found on bottom of Boardman Lake east ends of 13th and 14th Streets. MDEQ procedure 51 found acceptable to poor aquatic organism populations; habitat scored marginal to good; zebra mussels comprised 53-77% of all bottom-dwelling organisms found in Boardman Lake. Evidence of leachates from former disposal site have appeared along the banks of Boardman Lake adjacent to the former Boot Lake Dump, and along Boardman River at the former Keystone Dump site. A “dead zone,” devoid of plant and animal life, was identified in the nearshore environment between 14th and 15th Streets. The area in question is approximately 150 yards long and extends 75 yards into the lake. The study recommends that further investigation, monitoring and remedial measures should be considered and undertaken where necessary – and funding is available – to protect and improve water quality in the Boardman Lake watershed. Continuing work to protect and restore this overlooked jewel of Traverse City will build upon improvements and redevelopment along the lake that have occurred in recent years including the improvements made in Hull Park, upgrading the wastewater treatment plant and the ongoing redevelopment of former industrial sites along the lake. Encourage the use of “low impact development” stormwater treatment techniques to minimize the impacts of impervious surfaces, runoff and other potential impairments to water quality. Upgrade or update applicable ordinances for Garfield Township and City of Traverse City to accommodate and encourage more innovative forms of stormwater management. Remove tires, drums, various scrap metal, wooden pallets, bricks, ceramics and other debris from Boardman River and the southern end of Boardman Lake. Initiate education efforts that promote the essential link between land use and water quality protection and improvement (ie, promote the retention or establishment of shoreline vegetative buffer, minimize vegetation removal and mowing to the water’s edge, eliminate the dumping of grass clippings and other yard/solid wastes into the water). Note: Local governments should consider ordinance changes to ensure best management practices are utilized on private property along the water’s edge and adopt these practices for the maintenance of public lands. Avoid future wetlands loss within the watershed. Undertake further evaluation and monitoring of nutrient, bacterial and toxic pollution sites found during the study.